Ah, vacation. It makes you think of days where meal prep and laundry are forgotten while you have fun with your family. So why am I talking to you about groceries!? In my experience, a handful of groceries ordered from Garden Grocer will save you money and frustration when you visit Disney World. Quick service breakfast lines can be long in the mornings. If you are like me you won’t want to start a day at the parks waiting in a long line for a bagel. If your kids are anything like mine they can take a long time to eat. In the room this is less bothersome since I can get Elizabeth dressed, ready and started on breakfast. While she is eating I can usually eat and have time to make sure everything we need is repacked in our park bag. After a long day of walking at the parks the last thing I want to do is walk to the food court, quick service restaurant or gift shop of our hotel. I’d much rather have something available in the room. Having snacks in the room also means an earlier bedtime than if people are waiting on something to eat. Buying breakfast supplies through Garden Grocer is more expensive than shopping at home but much less expensive than if we purchased breakfast each morning of our stay. This is true of our late night snacks, too. Those little food items and drinks can add up quickly at Disney World. If you are staying at the Wilderness Cabins or a Deluxe Villa with full kitchens you can opt to cook a meal instead of eating at the parks. This again can be a cost savings. Where would I keep my refrigerated items? Some resorts have mini-fridges or beverage coolers already in the room. If not, you may ask as many can have a mini-fridge or beverage cooler brought into the room for your stay. Wilderness Cabins and Deluxe Villas have full-size refrigerators (except for studio villas which have a mini-fridge). 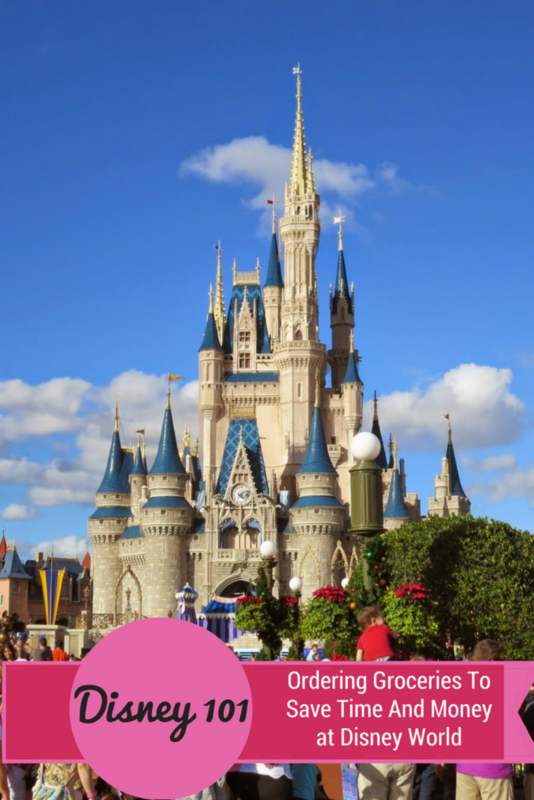 Check with Disney World for more information on the availability of refrigerators and beverage coolers. Make your initial order and confirm it as early as possible. This secures your delivery date and time. Groceries can be ordered months in advance or a few days before your trip. I would recommend ordering 2 weeks prior to your trip. Order earlier if visiting Disney World around spring break or Christmas. Groceries are not purchased for your order until about 48 hours prior to your delivery window. Therefore, there is no incentive to wait to place your order. You also have the opportunity to add-on products to this order up to 3 times (if done 3-5 days before delivery window) for no additional delivery charge. The initial order and add-ons will be delivered together. If you need to cancel or reschedule your order do it more than 2 days before scheduled delivery to avoid a restocking fee. Once the initial order is delivered you can replenish your order up to 3 times with no additional delivery charge. What that means is if you run out of milk or even forgot to order something you can contact Garden Grocer, place an order of less than $40, and it will be delivered within 24 hours with no additional delivery charge. If you have a food allergy record it in “Notes” section. That way if a requested product is not in stock it will not be substituted with a similar product without a phone call to you. This will give you the opportunity to verify ingredients to avoid food allergy issues. The notes section is located at the very bottom of the delivery page when completing your order. Looking for a product that is not on the website? You can ask for the item in the “Request An Item” section. It is located below the delivery address section at check out. Garden Grocer will contact you 3-5 days prior to your scheduled delivery to let you know if product is available. Have you ordered from Garden Grocer before? If so, logging into your account gives you the option to copy a previous order. This feature saves time and helps you to remember the essential items you previously ordered. When you order from Garden Grocer you choose a delivery date and time slot. If you haven’t arrived or your room is not ready the bell desk of your hotel will take delivery of your items. This includes cold or frozen foods which will be appropriately cold stored. Once you are ready, you call down to bell services and someone will bring the Garden Grocer order to your room. Browse either online or using the Garden Grocer iOS app. 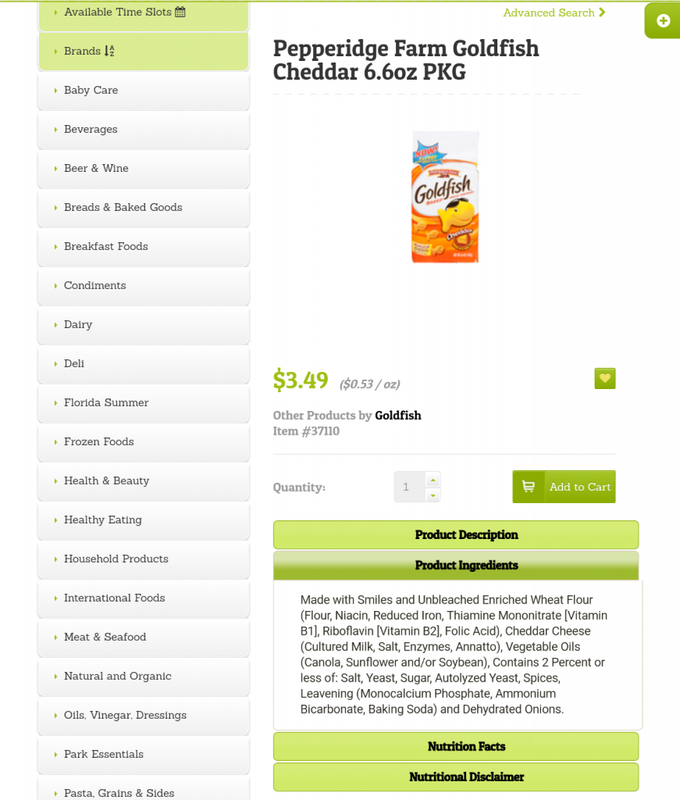 If you click on an item it will show you the product description, product ingredients, and nutritional facts. Add chosen item to cart. Once you have chosen all of your items start the check out process. First you will provide your name, email address and a mobile phone number. 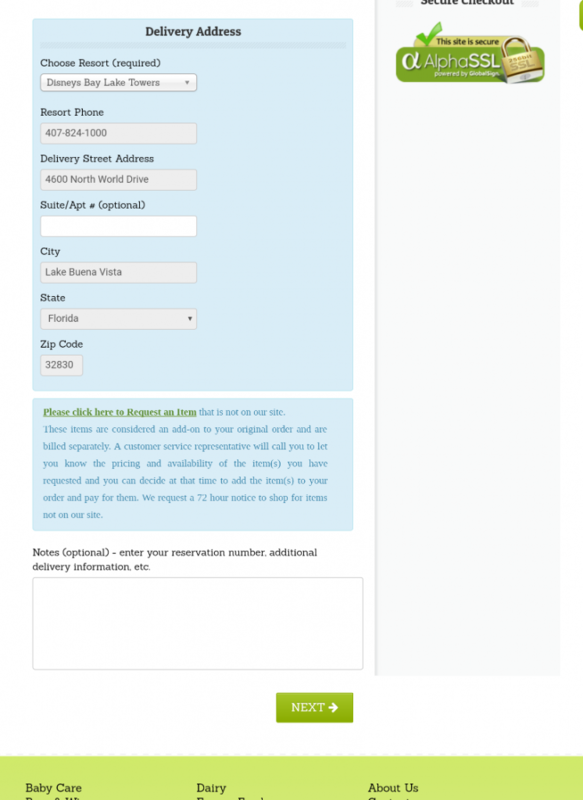 When you choose your resort for the delivery the address will autocomplete other fields. Next you can request an item or add a note before moving on. Third, enter your billing information. Here you can see if early order discount was applied, the delivery fee, and the cost of your items for a grand total. Lastly, review and confirm your order. You will pay for the cost of groceries ($40 minimum), plus delivery fee ($14 for orders under $200, otherwise $2), and gratuity if you choose. Do you have other questions? Garden Grocer has a frequently asked questions section that can probably answer them. You can also keep up to date by following me on Facebook, Instagram and Pinterest. How would I know what hotel room number we are 2 weeks in advance to get delivery ? If it asks for room #? Thank you. With Garden Grocer you only need to provide your name and the resort name. Garden Grocer will deliver to the Disney World resort and bell services will hold your items (even cold storage ones) until you arrive. Once you are in your room then call bell services for delivery to the room.